Ukraine and Russia have started to celebrate Baptism of Rus Day relatively recently. This holiday celebrates the start of Christianization of Kievan Rus in 988 and it's annually observed on July 28. This holiday emerged in Ukraine in 2007 as an unofficial celebration. 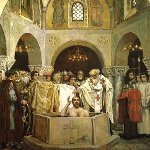 In July 2008 President of Ukraine Viktor Yushchenko signed a decree, establishing Day of Baptism of Kievan Rus on July 28. This holiday commemorates the death of Vladimir the Great (July 15 according to the Julian calendar, July 28 according to the Gregorian calendar). The same holiday, called Day of Baptism of Rus, was established in Russia on May 30, 2010, the first celebration took place on July 28 , 2010, that was the 1020th anniversary of baptism of Rus. Vladimir the Great played an important role in Christianization of Kievan Rus. This important event took place during his rule in approximately 988 (in fact this process lasted for a much longer period of time). But Vladimir the Great wasn't the first monarch of Rus who was baptized. Princess Olga was baptized much earlier than Vladimir the Great, but she couldn't make Christianity to be a national religion.